The chart below was inspired by a similar one featured by Max Ehrenfreund in his recent Wonkblog post titled “We’ve had a massive decline in gun violence in the United States. Here’s why.” In contrast to the widely embraced narrative, perpetuated by liberal politicians and the media, that gun violence in America is getting worse all the time, the data reveal that the exact opposite is true. 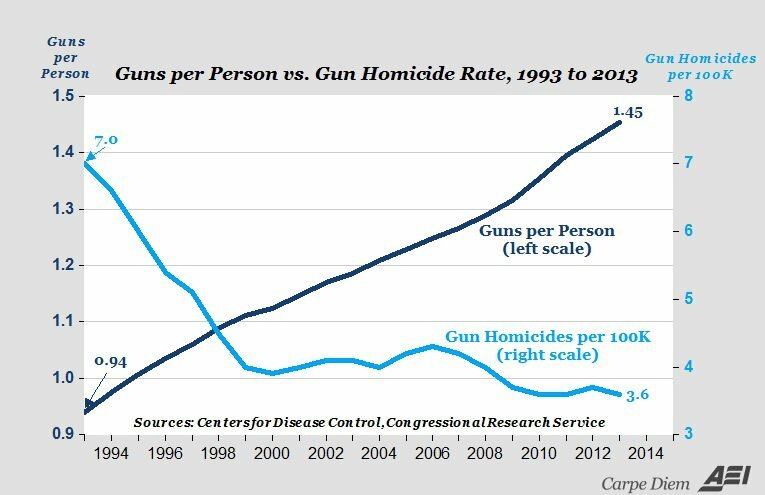 According to data retrieved from the Centers for Disease Control, there were 7 firearm-related homicides for every 100,000 Americans in 1993 (see light blue line in chart). By 2013 (most recent year available), the gun homicide rate had fallen by nearly 50 percent to only 3.6 homicides per 100,000 population. Ehrenfreund says that “Even as a certain type of mass shooting is apparently becoming more frequent, America has become a much less violent place. Much of the decline in violence is still unexplained, but researchers have identified several reasons for the shift.” He then points to factors explaining the decline in violent crime in general and gun homicides in particular, including more police officers on the beat making greater use of computers, a decline in alcohol consumption, less lead exposure, and an improving economy. But there’s another possible reason for the decline in gun violence overlooked by Ehrenfreund – the significant increase in the number of guns in America, illustrated above by the dark blue line in the chart. Based on data from a 2012 Congressional Research Service (CRS) report (and additional data from another Wonkblog article “There are now more guns than people in the United States”), the number of privately owned firearms in U.S. increased from about 185 million in 1993 to 357 million in 2013. Adjusted for the U.S. population, the number of guns per American increased from 0.93 per person in 1993 to 1.45 in 2013, which is a 56 percent increase in the number of guns per person that occurred during the same period when gun violence decreased by 49 percent (see new chart below). Of course, that significant correlation doesn’t necessarily imply causation, but it’s logical to believe that those two trends are related. After all, armed citizens frequently prevent crimes from happening, including gun-related homicides, see hundreds of examples here of law-abiding gun owners defending themselves and their families and homes. "So after all the pro-gun control grandstanding and the relentless focus on how the so-called easy availability of guns drives up crime, the CRS report shows that more guns–especially more concealable guns–has actually correlated with less crime." 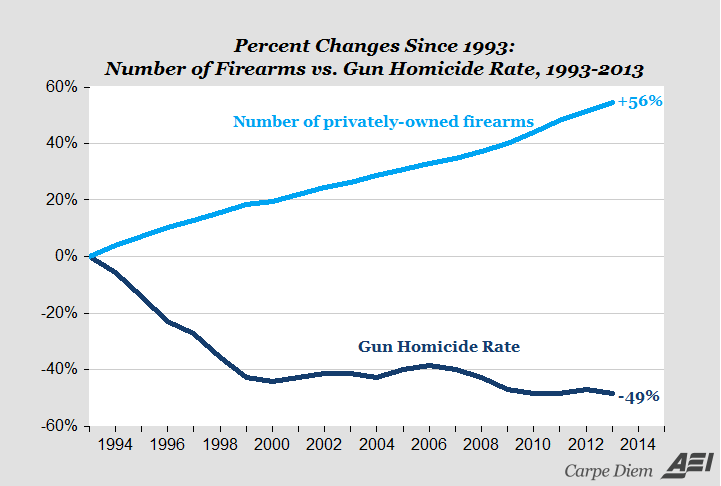 Bottom Line: Even if you’re not convinced that increased gun ownership reduces violent crime and gun homicides, you should be totally convinced of this indisputable fact: Gun violence has been decreasing significantly over time, not increasing as you’ll frequently hear from anti-gun politicians and progressives. The gun-related homicide rate of 3.6 deaths per 100,000 population in each of the years 2010, 2011 and 2013 makes those recent years the safest in at least 20 years, and possibly the safest in modern U.S. history, since “older data [before 1993] suggest that gun violence might have been even more widespread previously,” according to Ehrenfreund. Update: In the comment section below, David says that “The [top] chart you created is misleading. If both values were either per capita or per 100,000 people and plotted on the same scale, the lines would not cross as depicted. You manipulated the range of the y-axis to create that artificial intersection.” In response, I created the second chart above, showing the percentage changes in both variables (guns per person and the gun homicide rate) since 1993 as an alternative way to graphically display the relationship between those two variables over time using a single, unit-free scale measured in percentage changes of both variables. That should avoid the criticism (sometimes justified, sometimes unjustified) that is sometimes leveled against “dual scale” charts, like the example below provided by David in his comment. This article originally appeared on the American Enterprise Institute’s AEIdeas page on December 4, 2015. Reprinted with permission of the American Enterprise Institute, Washington, DC.